We bring you a presentation of the best photos in the last 24 hours from around the world. Jailed Russian former oil tycoon Mikhail Khodorkovsky (right) looks out of the defendant's cage as he attends a court session in Moscow. Khodorkovsky is currently serving an eight-year jail sentence on tax-evasion charges related to his time at the head of Yukos. That sentence runs out in 2011. Now he and his business partner Platon Lebedev are accused of stealing 218 million tons of oil. 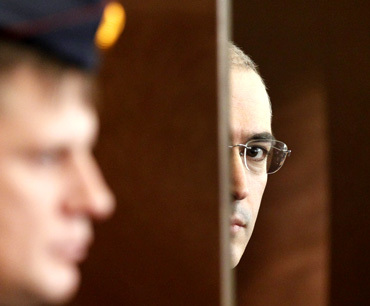 If convicted of stealing the oil Khodorkovsky faces another 15 years in prison. 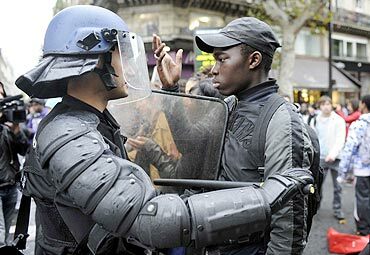 A French high school student faces anti-riot gendarmes during a student demonstration at the Place de la Republique in Paris. France faced its seventh day of nationwide strikes and protests in two months on Wednesday as trade unions sought to force French government to back down on an unpopular pension reform raising the retirement age. 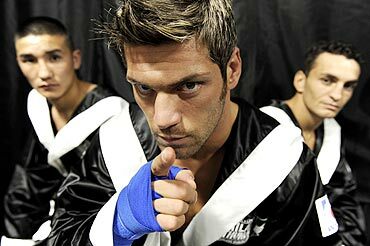 Italian boxer Clemente Russo, leader of the Milano Thunder boxing team, poses with teammates in Milan. Italian fashion designers Domenico Dolce and Stefano Gabbana have hooked up with the boxing team in a first sponsorship deal as they look to pack more punch in the outdoor and lifestyle markets. Picture taken October 18. 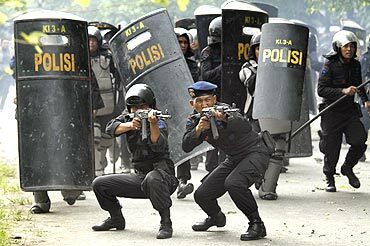 Anti-riot police point their rifles to disperse students during a protest against the visit of Indonesia's President Susilo Bambang Yudhoyono in South Sulawesi province on October 19. The students were protesting Yudhoyono's performance during his six years of leadership. Medi Steigleder, who works on board the new ICE German high speed train, stands on the platform after it arrived at St Pancras station in London. Deutsche Bahn showcased a Siemens high-speed train in London on on October 19, which it hopes will run services to Germany through the Channel Tunnel, challenging Eurostar's monopoly and Alstom trains. The ICE 3 train, which can hit 320 kilometres per hour, was on display at London's St Pancras station following safety tests. Deutsche Bahn is aiming to operate services from London to Frankfurt and Cologne by the end of 2013. 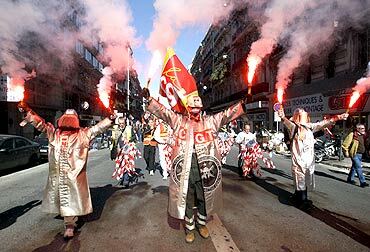 Arcelor Mittal steel workers dressed in protective work suits demonstrate over pension reforms in Marseille on October 20. France faced its seventh day of nationwide strikes and protests in two months on Wednesday as trade unions sought to force French government to back down on an unpopular pension reform raising the retirement age. 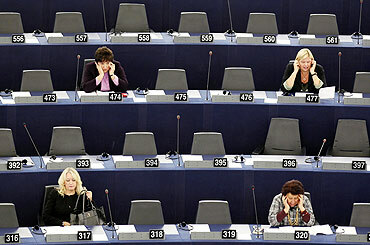 Members of the European Parliament attend a debate on the working conditions of women at the European Parliament in Strasbourg. Note the vacant seats! 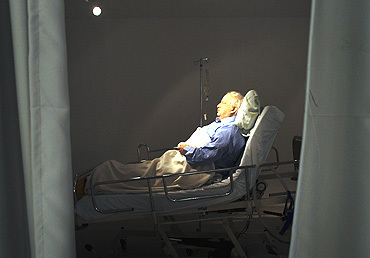 An art installation depicting former Israeli Prime Minister Ariel Sharon lying comatose in a hospital bed is displayed before it's official opening at the Kishon Gallery in Tel Aviv. Israeli artist Noam Braslavsky created the life-size installation of Sharon, who has been in a coma since suffering a massive stroke in January 2006.The exhibit opens to the public on Thursday. 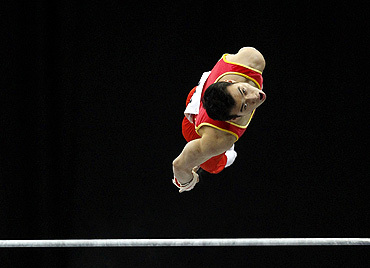 Lu Bo of China performs on the horizontal bar during the men's qualifying round of the Artistic Gymnastics World Championships in Rotterdam. 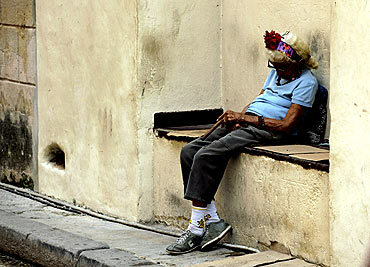 Graciela Gonzalez sleeps while holding onto a cigar in Havana. Gonzalez, 86, is a licensed street entertainer and earns a living posing for tourists, charging them one CUC (Cuban convertible Peso) ($1.05) for them to take her picture.